When slitting and rewinding material with caliper or thickness variation, the finished reel diameters will build at different rates. This will cause some rolls to be wound tighter and others to be less so causing an overall issue with the rewind quality. To prevent this issue, it is recommended that differential winding shafts are used. 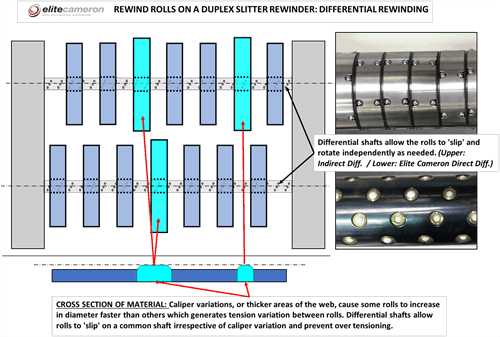 “Diff Shafts” will allow for even tension in each roll by allowing rolls that build quickly to “slip” on the shaft as needed. This will help to ensure good quality rolls off the rewind.